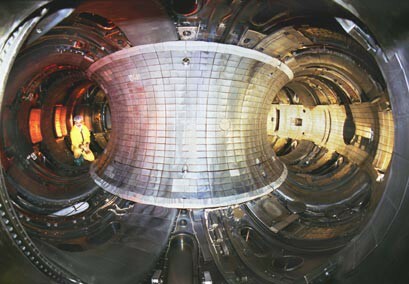 Interior of the TFTR Tokamak. Photo courtesy PPPL. It was ten years ago on 4 April that the Tokamak Fusion Test Reactor (TFTR), at the Princeton Plasma Physics Laboratory (PPPL), USA, closed after 15 years of operation. The construction of TFTR started in March 1976 as part of a major US Energy R&D effort in response to the Gulf oil embargo of the mid-1970s. TFTR was the first of the three large tokamaks (TFTR, JET and JT-60) to begin operation, on 24 December, 1982. For the next 15 years, TFTR operation performed at the frontier of fusion research. In 1996, the US fusion budget was cut by 35% forcing a restructuring of the US fusion program that resulted in the premature termination of TFTR operation on 4 April 1997. TFTR achieved all of the original project goals and made numerous contributions to fusion physics and the understanding of tokamaks.